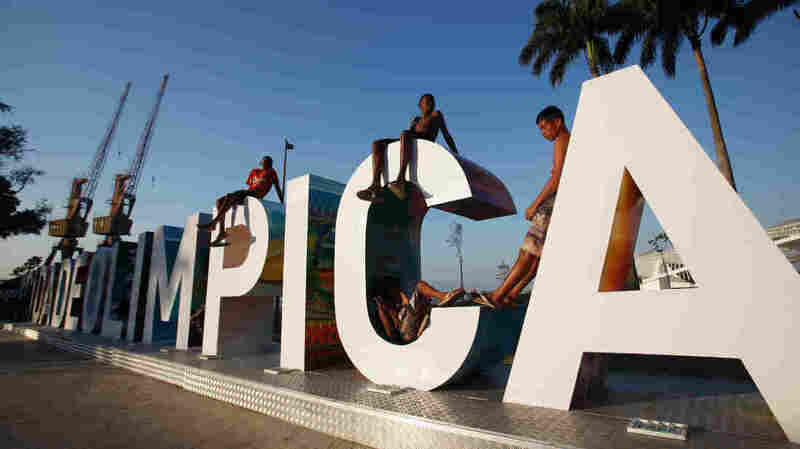 Brazil's Latest Headache: Ticket Sales Lag For Rio Olympics : Parallels The Summer Games open Aug. 5 in Rio de Janeiro, but the country's many problems seem to be turning off ticket buyers in Brazil and abroad. Teenagers sit on a new sign reading "Cidade Olimpica" (Olympic City) in Rio de Janeiro's port district last October. Ahead of this summer's Olympic Games, the port district is undergoing an urban renewal program. Ticket sales have been slow, and many Brazilians cite the poor state of the economy, which is in recession. Brazil is battling a recession, political chaos, high crime and the spreading Zika virus. All these factors seem to be conspiring to drive potential ticket buyers away in advance of the Summer Olympic Games set to open Aug. 5 in Rio de Janeiro. Just over 50 percent of the Olympic tickets and 15 percent of the Paralympic tickets have been sold, according to organizers. Those are much lower figures than what London had sold at this point before the 2012 Summer Games. At Rio's revamped Gloria Marina last week, where Olympic sailing will take place, Brazil's new sports minister, Ricardo Leyser, suggested some of the options being considered for filling the stands. The government is thinking of buying tickets to the Paralympics and giving them to public schoolchildren because sales are so slow. Leyser argued — improbably — that slow domestic sales may partially be blamed on the fact that Brazilians were unaware they could attend. "Brazilians themselves haven't been alerted to the fact that they can go to Olympic events," Leyser says. Other factors are actually at play, according to other Brazilians. At a supermarket in Rio's Catete neighborhood, manager Jailson Galdinho is putting new price stickers on the shelves. "Prices are going up. Every day I have to adjust the prices of food," says Galdinho, adding that he's not planning to buy Olympic tickets. "It's too expensive." Asked if he was excited about the Games, Galdinho says "what's impressed me most is the shameless spending of public money on something that doesn't leave much for the future." The Summer Games were awarded to Brazil seven years ago when the country had a booming economy and was politically stable. Today, President Dilma Rousseff faces impeachment. Inflation is soaring and people are losing their jobs. They don't have a lot of disposable income to spend on tickets for sports they may not be interested in. As the sports minister spoke, foam cups and pieces of shoes bobbed in the water nearby, a visible symbol of the polluted waters where some of the competitions will take place. Many Brazilians say they'll be left with dirty water and empty venues, calling it an example of the misplaced priorities of Brazil's government and Olympic organizers. More worrisome for organizers, international ticket sales also have been weak. As the country deals with Zika, the mosquito-borne virus that has been tied to birth defects in newborns, health authorities have advised pregnant women not to go to the games. All this could mean that Brazil is stuck with many expensive venues and little to show for them. There's already evidence for this from the 2014 World Cup in Brazil, with the country building huge soccer stadiums that sit empty — and this in a country that's crazy about soccer. In the U.S., Smith College economist Andrew Zimbalist studied ticket sales when he wrote a book about the economic impact of hosting mega-sporting events. In an interview over Skype, he says that over the past several decades, there might be two or three cases in which an Olympic host city can argue that it has broken even, or may have gained something. "In the other cases, the amount of money that's spent in order to build the venues and build the infrastructure and operate the games far exceeds any revenue that they brought in, either in the short run or the long run," he says. Money from ticket sales won't pay back the Brazilian government, but will go to private investors in the games. Meanwhile, after cutting Olympic costs in January, the government this month hiked the total public money it's spending on the games to roughly $4.5 billion. Zimbalist says there is a "feel good effect" of hosting the Olympics. But it's short, and hard to measure. It's the "feel good effect" that Leyser, the sports minister, is banking on to get Brazilians excited about the games — that and a new advertising campaign aimed at ticket sales. He says he thinks Brazilians will buy lots of tickets at the last minute. It's the Brazilian way, he says.